The annual lunch of the Monte San Martino Trust always has the feel of a “family” occasion but in 2017 the family had grown somewhat. 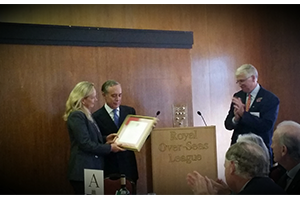 A total of 153 supporters gathered at the Royal Overseas League in London on November 9th, much the biggest turn-out yet recorded. It is 74 years since the Armistice with Italy, which precipitated the escape of Allied prisoners of war, but the interest in their story, and gratitude to the Italian contadini who hid and fed them in the hills, strengthen rather than diminish. Among the guests was just one veteran prisoner of war, Frank Unwin. But there were many children and grandchildren of escapers, as well as supporters without a family connection. The Trust’s chairman, Nick Young, speaking “above the merry tinkle of coffee cups”, as he put it, was quick to pay respects to Frank Unwin, who was present with his family and whose book, entitled “Escaping has ceased to be a sport”, was set for publication in April 2018. Sadly, a moment’s silence was held to remember two PoWs who had died in the previous 12 months – Mike Lacey and Mick Wagner – as well as Alastair Gavin a strong supporter and husband of trustee Caroline Gavin. Pasquale Terracciano, the Italian ambassador, chats to Nick Young, MSMT chairman. Nick summarised the work of the Trust over the past year, including the digitising of MSMT’s archive by a team led by trustee Christine English. Among her other tasks, Christine has for long been the chief organiser of the annual lunch – and was duly thanked by Nick who described her as a “Legend in her own Lunchtime”. 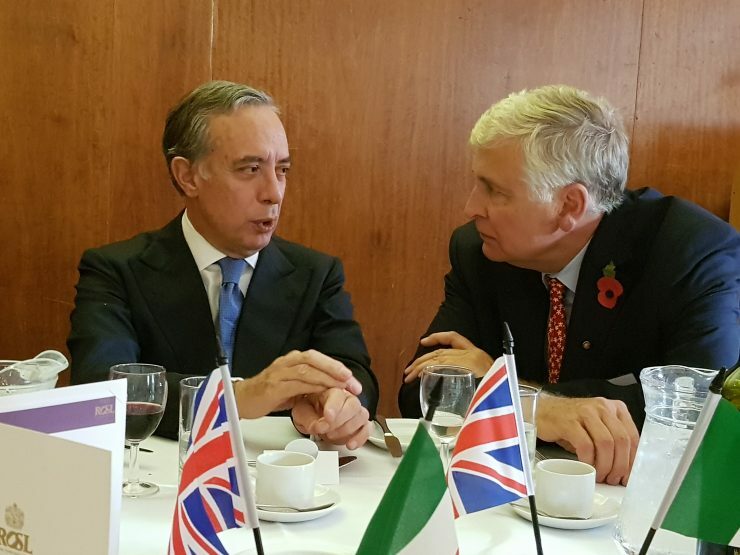 He then paid a heartfelt tribute to Pasquale Terracciano, the outgoing Italian Ambassador, and his wife Karen, who were both present, as on previous occasions. During their four and a half years in London, Mr and Mrs Terracciano have given the Trust unfailing support and encouragement, holding several functions at the embassy on its behalf. “Our £1m Appeal would not have been achievable without you,” Nick told them, before presenting them with a certificate recording the Trust’s gratitude, a copy of the recently re-published book “Home by Christmas?” and – “for bedtime reading” – a copy of his own travel blog. Nick added that Mr Terracciano, who was shortly to take up his post as ambassador in Moscow – “an absolute doddle” – had also backed the Trust’s efforts to have a permanent memorial to the Italian helpers of PoWs erected near the Church of the Immaculate Conception. Discussions were making good progress and a sculptor had been recruited. “The first is that, if asked what has been the most extraordinary story from my time in London, I would say the Monte San Martino Trust – it has no parallel. “Then, if asked for the most commendable initiative, I would say MSMT. When someone dies, the memories get lost but by creating the Trust you prevented this. As the Ambassador sat down, trustee Miles Skinner introduced our guest speaker, Bill Mills, chairman of Highfield preparatory school at Liphook. For six weeks in autumn 2017 Highfield hosted three pupils, aged 11 to 13, from a school in Fontanellato, where Bill’s father, Peter, had been a PoW. The Trust, whose own students must be over 18, helped facilitate the exchange, which will be completed when 12 Highfield pupils spend a week in Fontanellato in May 2018. Bill explained that he had come across the Trust though reading “Where the Hell Have You Been?” by Tom Carver and that, to organise the pupil exchange, he and colleagues had visited Fontanellato. At a restaurant, a man entered and announced that his own father had driven Bill’s father out of Fontanellato to safety in a taxi. Although there was more than one Mills interned in the camp, Bill likes to think this was Peter.